Take a chance and try a new pie this Thanksgiving. 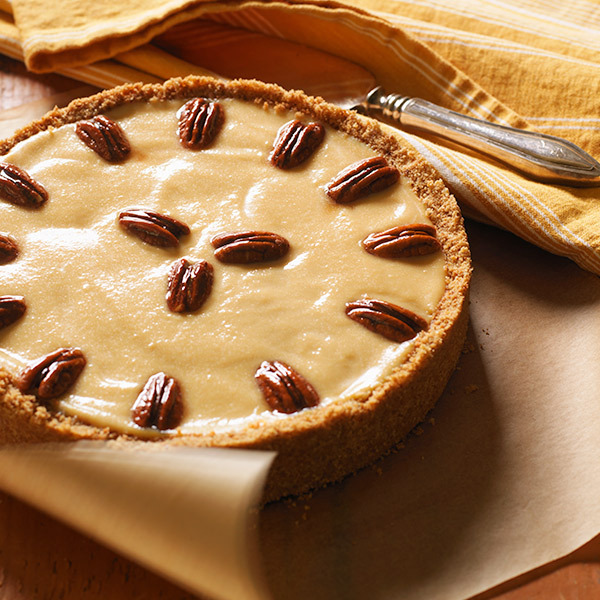 Hallmark's Pecan-Banana Tart features a vanilla wafer crust with a banana filling. Honey-roasted pecans dot the top, adding a nutty flavor and creating a pretty presentation. Your guests will thank you for this sweet alternative to traditional holiday pies. Make the crust: Preheat the oven to 375°F. In a food processor, process the cookies, pecans, brown sugar, salt and butter. Press into a 9-inch springform pan, coming ¾ inch up the sides, making thick sidewalls. Bake for 10 minutes to set the crust. Set aside to cool. Make the filling: In a small saucepan, blend the brown sugar, cornstarch and salt. In a bowl, whisk together the eggs and milk. Stir into the brown sugar mixture. Cook over medium heat, whisking constantly, until the mixture thickens, 5 to 6 minutes. Stir in the butter and vanilla. Set aside to cool to room temperature. Place a piece of buttered waxed paper or plastic wrap directly on the surface to keep a skin from forming.